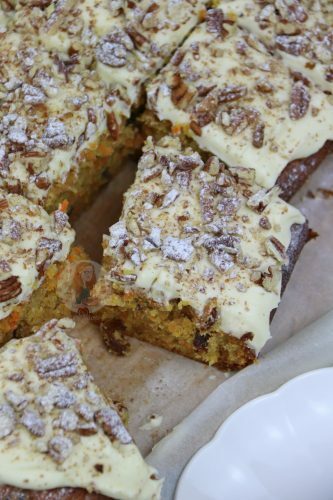 A Delicious, Easy, and Moreish Carrot Cake Traybake with Cream Cheese Frosting and Chopped Nuts! So, Easter time is full of Chocolate and such, which I obviously adore.. but its not to everyones taste. 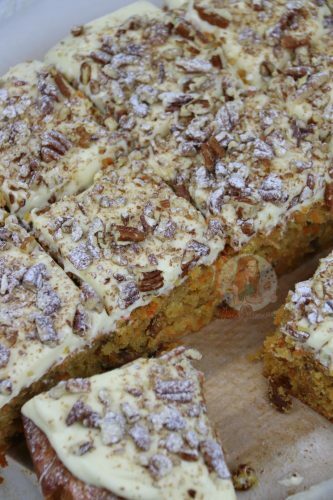 I get that, and I accept that, and to be honest… I love carrot cake. 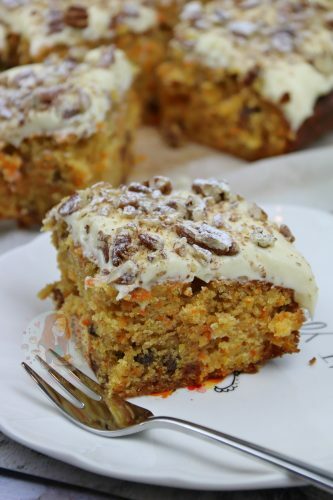 I based this recipe on my Carrot Cake recipe, and its just so good! Not trying to blow my own trumpet of course. It’s such a versatile recipe, that I thought I would make it a bit differently by making it into a traybake! Traybake cakes aren’t something I have done a lot of, but to be honest they are SO much easier than a layer cake! You just have to show it into the tin, bake it, and slather on the decoration! No fancy layering or piping required. I didn’t quite double my Carrot Cake recipe as it would have been too much for the tin, but its an ‘increased’ version which is ideal. I literally use a roasting tin for this as it was the right size, but any traybake style tin is good. You will just want it to be a similar size to the one I have used! I did make this slightly different to my Carrot Cake however and used a Cream Cheese Frosting like the one in my Red Velvet Cake. 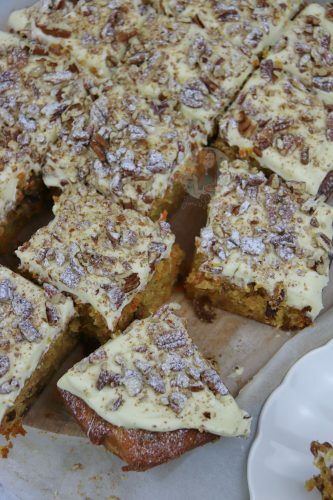 I thought a Carrot Cake Traybake would need a bit more jazzing up, and the Cream Cheese Frosting is ideal. Its silky, its smooth, and it tastes damn good. Often people can have problems with making a Cream Cheese frosting and its often down to over mixing, or the water content of the cream cheese. Some countries Cream Cheese has a higher water content, and even different brands do. If you feel like yours is extra specially water, you can try and squeeze some out before adding to the butter. When mixing the frosting, you want to be gentle. You really can’t over mix it otherwise you might have a sloppy mess! Either way though, because the cake will have to be stored in the fridge, it’ll firm the frosting up somewhat anyway! And then with the addition of the crunch of the nuts, its DELICIOUS. The cake itself is so light, and so (I hate to use the word) ~moist~, it is just delicious. 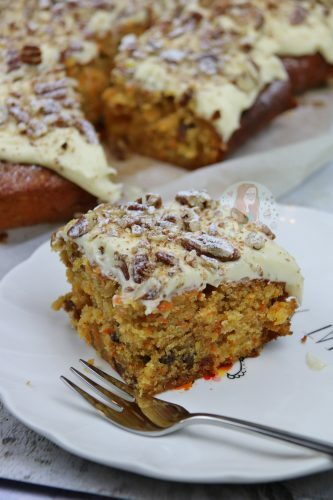 Honestly I think Carrot Cake is one of my favourite cakes, if not my actual favourite, so I devour far too many pieces when I make this recipe. Any you know, its got carrots and raisins in so its clearly healthy right?! Two or three pieces is some of your five a day?! No? Damn. You can see in the pictures how delicious it looks, but it is definitely versatile. Add more nuts, no nuts, add more raisins, or no raisins… its entirely up to you. If you wanted to use a buttercream topping so it doesn’t have to be kept in the fridge, then you can easily use the one from the original Carrot Cake recipe. It’s the best thing to do if you want it to be out at a party for example or you have to travel with it! Preheat your oven to 180C/160C Fan and Grease & line a large tin - I used a 10x13" Traybake/Roasting tin. Pour the Sunflower Oil & Eggs into a large bowl and add the sugar – mix lightly and combine. Add the Grated Carrots, Rasins, and Orange Zest and fold through to combine. Add the Flour, Bicarbonate, Mixed Spice, Ginger, & Cinnamon and mix again – try not to over mix! Pour the mixture into the tin, and bake in the oven for 25-30 minutes. Sometimes it can take a little longer so test with a skewer! Once baked, leave to cool in the tin for 10 minutes, and then cool on a wire rack. With a stand mixer/electric whisk, beat the room temperature/softened Butter for a couple of minutes so its really smooth. Fold through the the Cream Cheese so its combined, or beat on a low speed. Stir in the Vanilla extract. Gradually add in the Icing Sugar till its all combined – try not to beat too hard, you’ll want to do this bit by hand. I add usually about 500g, you want to add enough for it to be firm. Once the cake is fully cooled, slather the frosting on top. Smooth it over, and sprinkle on some chopped nuts (I used walnuts and pecans) and then give it a sprinkle of icing sugar! This recipe is based off of my Carrot Cake recipe with the frosting from my Red Velvet Cake recipe! 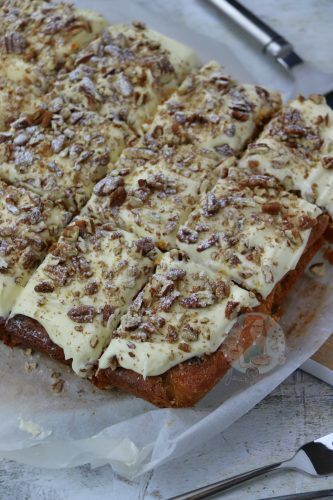 This cake should be stored in the fridge because of the Cream Cheese Frosting, and will last for three days! If your frosting is really loose, its probably because its been over beating. Gradually add in some more icing sugar by hand to thicken it up. The weight of the carrots in the recipe is already grated. Buy more (about 750g worth) to get the 500g of grated carrots. Make sure you peel them and chop the ends off! 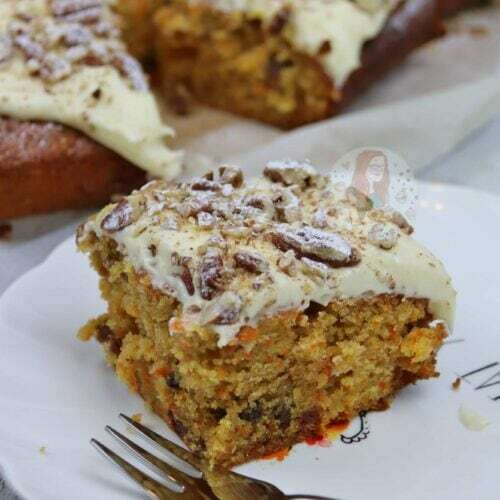 The Raisins in the cake are optional, and you can also add in 200g of chopped nuts to the cake as well if you wished! Find my other Cake & Easter Recipes on my Recipes Page! Older Next post: Malteser Brownies! Newer Previous post: Easter Piñata Cake! Ah yes, after a while you won’t be able to rescue it with sugar, but often if done correctly it can help. Can you use the mixture for mini carrot cakes in a mini muffin tin? Someone has asked me to make a 2 tiered mini version with frosting in middle as well as on top! Hiya! I’m sure you can, but its a very delicate cake so you have to be careful with it! Do you think this traybake would work as two layers? By that I mean could I make double and use as a cake filled with buttercream rather than a traybake? The size is just what I need for a cake that someone has asked me to make for them so it would be great if you could let me know what you think 🙂 Thank you! That’s great. Thank you so much 🙂 is it also ok without the raisins as the person who the cake is for doesn’t like raisins😕Sorry, I should have asked that before! I am assuming “mixed spice” I the equivalent of “all spice”? In the UK we have mixed spice, so I’m not 100% sure on the equivalent. It’s got like Cinnamon, Coriander Seeds, Ginger, Cloves, Nutmeg and such in. I used Mint ones for the Easter Cake, I don’t think they sell chocolate ones. This looks so good – another one of your recipes to add to my ‘must make’ list!